The Ki4488A c01c folding knife by Kizer Cutlery is a collaborative project between Kizer and Sheepdog Knives custom knifemaker Chris Conaway. It's a production version of his awesome custom design, manufactured with superior quality and premium features. It's an ideal sized folder that gives you the beefiness of a Sheepdog Knife in a more everyday carry sized and priced package. The 3.3" sheepsfoot blade is made from CPM-S35VN stainless steel with a wide cleaver-style shape perfect for a variety of utility tasks. The bearing pivot system allows for smooth blade opening, as with all Kizer knives. The full titanium handle is a wonder of ergonomics, it really contours to each and every curve of the hand with milled slots for looks and weight reduction. 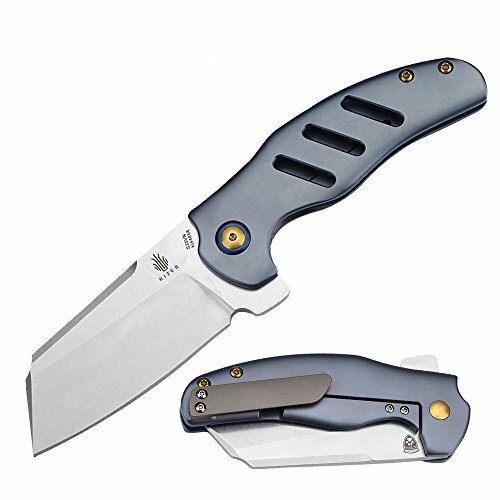 It features a deep blue anodized finish, gold hardware, custom pivot and pivot collar, a lockbar overtravel prevention mechanism, replaceable steel insert, and is an excellent knife built with a quality anyone can appreciate. The EDC-ready pocket knife includes a reversible tip-up carry clip for easy and safe carry.